At Hog Roast Flintshire we believe this county in North West Wales is the best place to have a roast. Flintshire is often called the “gateway to Wales” because it stands between Cheshire and Merseyside and the North Wales. Because of this it’s a great place to use as a tourist base, offering access to the nearby cities of Liverpool and Manchester, and of course Chester’s Roman history, as well as miles of stunning North Wales coast. It’s great to cater here because people really care about where their food comes from. Flintshire is a Fairtrade County, which means it’s committed to the promotion of Fairtrade goods that of course includes foodstuffs like coffee, chocolate, and some fruits and vegetables. Wales itself was the first “Fairtrade nation”. This attitude is also reflected in their local food. Flintshire has several long-established town markets. For example, the weekly ones in Connah’s Quay and Flint, and the twice weekly ones in Holywell and Mold had been going since ancient charters were established. And of course, you can get fantastic local food at all of them – Mold’s is one of the busiest markets in the country. This is something that’s important to us too. Our service is heavily localised, allowing us to source from local suppliers and tailor our roasts to individual needs. At Taste the Cracklin’s Flintshire Hog Roast, we offer more than just hog. Won’t or can’t eat pork? Then we offer a range of different meats including poultry, lamb and beef. We even offer a menu where you can have sausages and burgers alongside the traditional hog roast, giving everyone a choice – although it might be difficult to decide! You can also request vegetarian options. Because of its unique position, Flintshire hog roasts are fantastic. Whether they’re back from a day of retail therapy, or a long walk along some of the 870 mile All Wales Coastal Path, its always good to see people attacking our food with gusto. The only complaint is that they have to wait for the chef to carve! Once the roast is cooked, our Hog Roast Flintshire chefs put on the spectacle of carving the whole pig, which always goes down a treat. The meat is so tender the guest don’t have to wait long, and they’re soon tucking in to white floured rolls packed with warm meat that’s seasoned by sage and onion stuffing and apple sauce. And of course there’s crackling too. For those who like to pair their roast with it’s other traditional accompaniment – beer – there’s also another great reason to have a hog roast in Flintshire. Every year since 2009 the area has hosted the Real Ale Trail, a bus-based real ale festival. The idea is simple. The buses take to the trail and the customers get to drink in all the pubs along the route – and no arguments over who has to be the designated driver! All it needs is the application of some roasted meat to make it perfect. Some would say that some of the beautiful countryside here in North Wales is made for the culinary wonder that is hog roast. The rolling hills that and stunning majesty that forms the incredible landscape that is Snowdonia is quite the most perfect example of why this part of the United Kingdom is one of the most stunning settings anywhere in Europe. Such an incredible setting needs a suitably incredible feast and it seems only right that if you are planning to have a hog roast in Wales then these amazing surroundings would certainly be a very appropriate setting for such great tasting food. But there is of course much more to North Wales than Snowdonia and you certainly do not need to be immersed in the incredible countryside to enjoy one of the best catering solutions that we have at our disposal. Indeed, hog roast is certainly making a name for itself at all sorts of social events and special occasions in North Wales and elsewhere in the country. Good job too after years and years of mediocre catering food that was so dreary, it made people leave early for a takeaway. It seems that with hog roast, we really do have a fantastic alternative to those tiresome options that leave so many people cold (and hungry). It certainly does seem that the hog roast North Wales event i9s becoming more and more popular with any people booking a bit of spitting pig for their main event. And who can blame them? A hog roast is a quite brilliant way to not only give your guests superb tasting food that will remember for some time to come but also impress all those present with its great theatrical approach. No-one can fail to be impressed by the sight of a whole pig being professionally roasted for all to see. 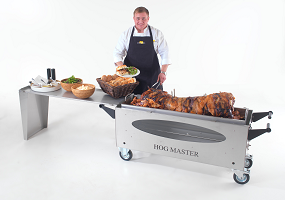 Probably the only people who would be unmoved are those that used to serve up those terrible catering solutions that we have all grown tired of, though maybe deep inside they secretly do admit that hog roast is quite the most perfect catering solution after all!